Do you wish to hide old or out-of-date articles as well as posts from your blog's homepage without deleting all of them? Generally, bloggers don’t choose to hide the posts from their homepage. However in some unusual cases they also choose not to show all of them. A blogger never want to show some sort of finished giveaway articles or blog posts and out of date coupons as well as expired articles. After ending any giveaway you must have to hide that post from homepage of your blog so that new visitors should not participate in it. It also leave a bad impact on them. Every blogger want to serve merely fresh and excellent articles as well as content for you to his/her blog users. So today i am going to show you how you can hide specific posts from your blog's homepage. First you have to login your blogger account. After logging in go to blogger Dashboard>>Templates>>Edit html and search for the below code in your blog template html [ Use Ctrl+F to search ]. Now replace the above code with the following coding lines. * Don't forget to replace Your Post URL with your blog article or post link which you want to hide from homepage. In same way you can hide more post from homepage.Now save your template and view your blog homepage.That's it, you have successfully removed useless articles from your homepage. Go to blogger Dashboard>>Templates>>Edit html and search for the ]]></b:skin> tag in blog template. Then paste the following CSS code just above the ]]></b:skin> tag. To hide more than one post, place the following code just below the above CSS code. Your can hide more posts by placing above CSS code line again and again.After placing the code save your template and view your blog homepage to see changes. Go to your blogger Dashboard>>Templates>>Edit html and search for the following code in your blog template. Replace the above four lines of coding with following code. Replace Your Blog Label Name with specific label name which posts you want to hide from homepage.Congratulation you have successfully removed posts under specific label from your blogger blog homepage. How to Hide/Remove Backlinks In Blogger Comments? 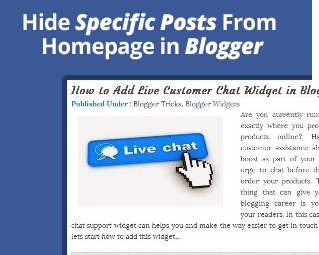 So you have successfully hide specific posts from your blog homepage. Now It's your turn to share this post and write your views in comments till then Happy Hiding.